Lick 7 Joop Wolters - . :Shred Tricks - Shred Guitar Lessons by Eric Maldonado:. 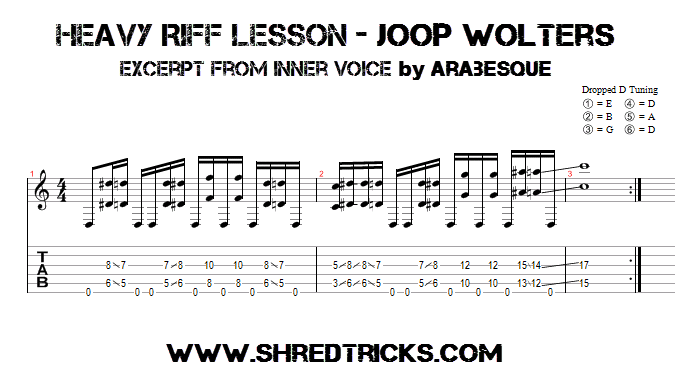 Today we have a great riff lesson by my good friend and dutch virtuoso, Joop Wolters. This riff is an excerpt from the song "Inner Voice" by his old band Arabesque. The riff is quite simple to get a hold of right from the get go and it will for sure spark up some new ideas for you if you aren't familiar with riffing like this already. 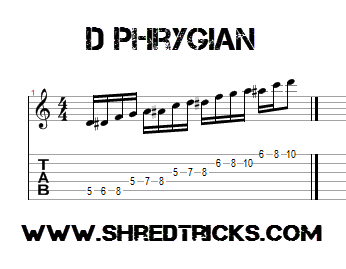 This riff is in the key of D Phrygian. 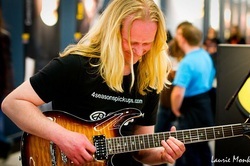 Take note of his use of slides, open chugs, and octaves to create a very cool riffing sound.